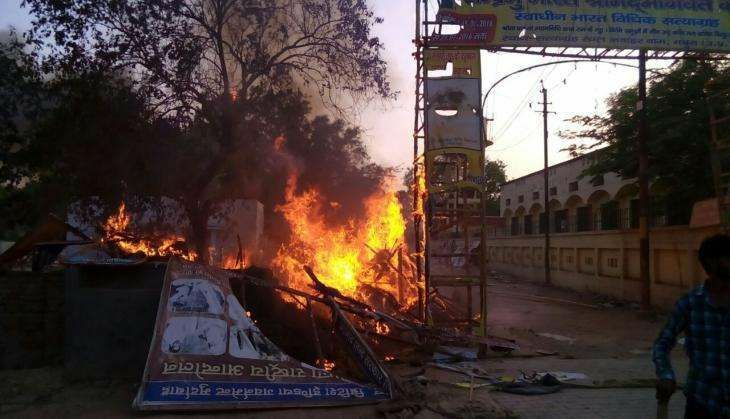 The Allahabad High Court today deferred its hearing till 14 July on a Public Interest Litigation (PIL) seeking a CBI inquiry into the Mathura violence, in which two police officers were killed. The petitioner Ashwini Upadhyay contended before the Division Bench of Justice Vikram Nath and Justice Ravindra Nath Kakkar that the Uttar Pradesh government had in January 2014 granted permission for a group of 200 persons to hold a demonstration inside Jawahar Bagh in Mathura for two days. However, the demonstrators went on to illegally occupy the public park for more than two years. In the meantime, their number swelled manifold and they ended up storing large quantities of firearms and ammunition and articles of daily use at huts erected illegally inside Jawahar Bagh. He said eviction began only after repeated directions and warnings from the High Court. "All these things establish that those leading the squatters enjoyed the patronage and protection of people enjoying power and clout in the state administration," Upadhyay alleged. Furnishing media reports which claimed that the deceased cult leader Ram Vriksh Yadav, self-a styled supremo of the squatters, was close to a senior cabinet minister in UP and a Rajya Sabha member of the ruling party in the state, Upadhyay contended that a CBI inquiry, monitored by the court if the need be, was "essential to provide credibility and instill confidence in the investigation." Appearing on behalf of the state government, Advocate General Vijay Bahadur Singh argued that a judicial inquiry has already been ordered into the incident and that a PIL with the demand for CBI inquiry has been turned down by the Lucknow Bench on 13 June last. This was countered by Upadhyay, who claimed that he was praying for CBI inquiry on merit unlike the petition filed before the Lucknow Bench, which was dismissed on the ground of being "frivolous, mischievous" and "filed for personal gains instituted at the behest of a person seeking publicity". Upadhyay also pointed out that while the petitioner, who moved the Lucknow Bench, was rapped for opposing the appointment of a retired High Court judge by the state government to the Commission of Inquiry on the ground that he was not a Hindu, "we would have no problem if the court assigns the same judge the task of monitoring the investigation by CBI." Upadhyay, who is the spokesman of the BJP's Delhi unit, also repudiated the Advocate General's charge that his petition was "politically motivated" and cited a number of PILs filed by him before the Supreme Court. The Advocate General thereafter sought time to gather some more facts in support of his arguments, following which the court fixed July 14 as the next date of hearing in the matter.